Month of September flew by so quickly. I have been procrastinating to put this post from beginning of this month. If you were a FlavzCorner reader, you would know that I attempt to post at least a birthday cake during this month. Since many special occasions fall into this month, I make sure to bake at least one cake to celebrate all in one. I wanted to bake something simple and easy for Nathan’s birthday. I discussed few ideas with my daughter and she approved the coffee flavored cake as they started tasting the Starbucks Lattes lately. 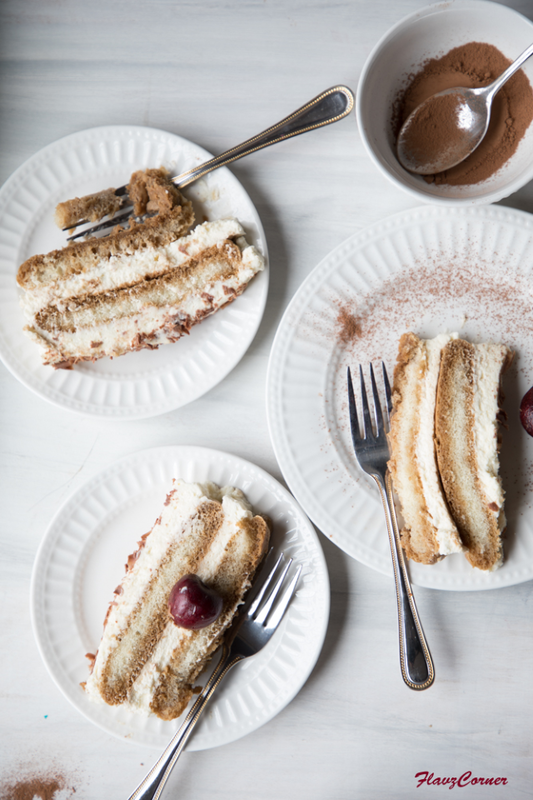 My family loves Tiramisu and it is one of our favorite desserts we order when we eat out at Italian restaurants. A make ahead ice cream cake was my preference, but then I realized I made an ice cream cake for his last birthday. 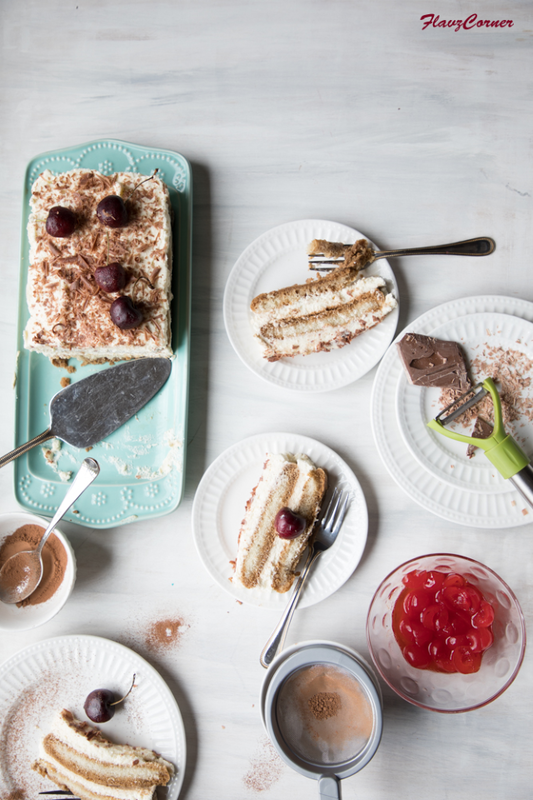 I searched for the easy Tiramisu I could whip up the day before the birthday and found the one from Laura in Kitchen. 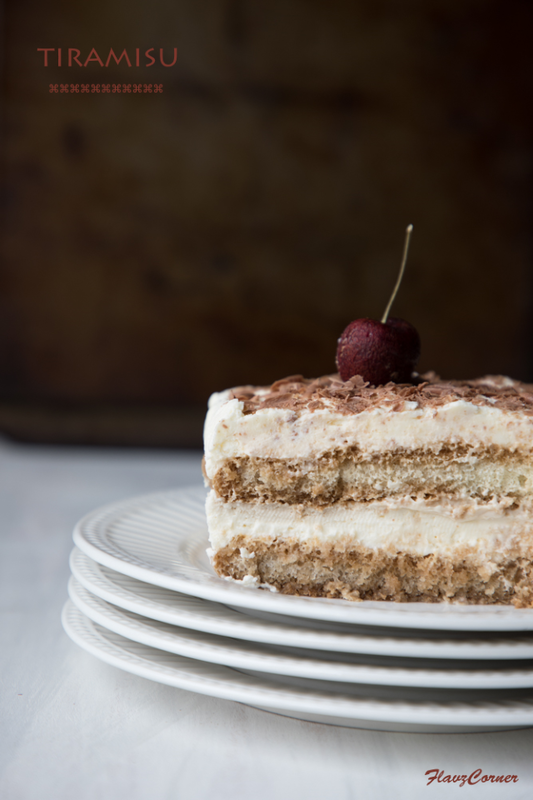 The minimum number of ingredients and the ease to make this dessert spurted me to go forward with Tiramisu. 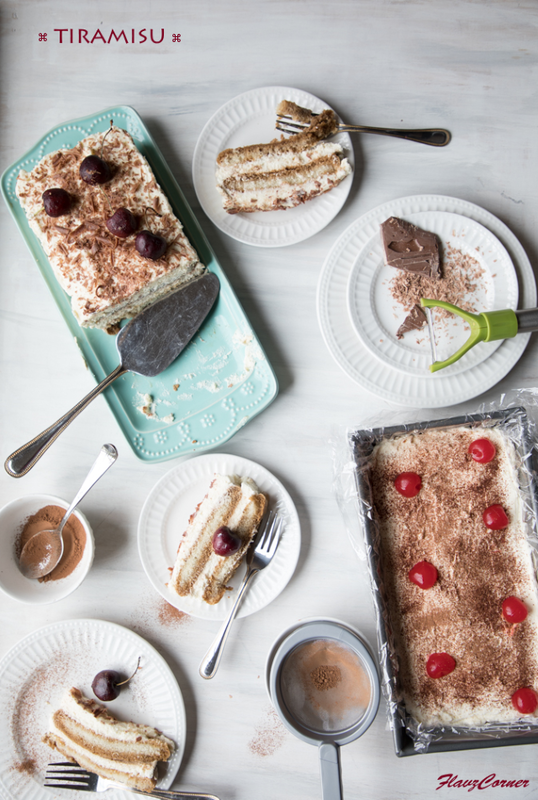 Tiramisu being one of the favorite dessert, I knew that one loaf pan sized Tiramisu will not be enough for us. So I decided to go with two loafs. My family gave me thumbs up for the Tiramisu. I adjusted the recipe little bit to fit my family’s taste, but it was mostly adapted from Laura in kitchen. Cream together the softened Mascarpone cheese and 1/3 cup of sugar using a hand whisk in a big bowl. Whip together the heavy cream, powdered sugar and vanilla extract using a stand mixture of hand held mixture to form soft peaks. Gently fold in the whipped cream into the Mascarpone sugar mix in batches. Make sure not to deflate the whipped cream. Line a loaf pan with plastic wrap with enough over hang on four sides. Mix the rum into the cold coffee in a bowl. Dip one lady finger at a time into the cold coffee and rum mix just to coat the top and bottom and place it horizontally into loaf pan. Six to 7 of them should fit in one layer. Now add half of the whipped cream and mascarpone mix on the lady fingers and level using a spatula. Repeat step 5 with rest of the lady fingers and whipped cream mix. Top the cream layer with chocolate shavings or dust cocoa powder on top of it. Be creative to decorate the top. Cover the loaf pan with the overhang of the plastic wrap and refrigerate for 8 hours or overnight. Take the loaf out of the pan using the plastic wrap overhang, slice, top each piece as you desire, and enjoy. Make sure you do not use the sponge version of lady fingers, they will not retain their shape when dipping in coffee. Do not over soak the lady fingers in the coffee, as they will get soggy and break easily. Just a quick dip would be enough. Make sure the coffee is cold while dipping the lady fingers in it; otherwise the lady fingers will break. You can adjust the sweetness of the cream filling as you wish. You can skip Rum in the recipe if you do not like it. It still tastes good.